A great importance for the company’s business makes transportation. T.B.Fruit guarantee timely production delivery to each customer.This is possible through cooperation with transport companies Tank Trans (Ukraine) and Tank Trans Polska (Poland) which are engaged in domestic and international transportation of liquid cargotankers. Before loading tank trucks are subjected to special sanitary treatment in accordance with the requirements of applicable health standards and regulations. All tanks are certified for transportation of food substances. 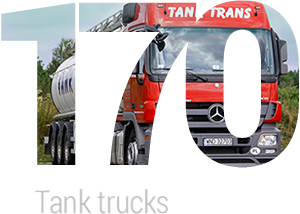 Tank Trans is a modern automobile operating company with the truck fleet of 170 vehicles, own maintenance service and specialized wash for tank trucks. The vehicles movement and their status are monitored in real-time mode by means of traffic monitoring GPS-systems. The company Tank Trans also provides services involving the domestic and international transportation to external companies.